Mark your calendar! 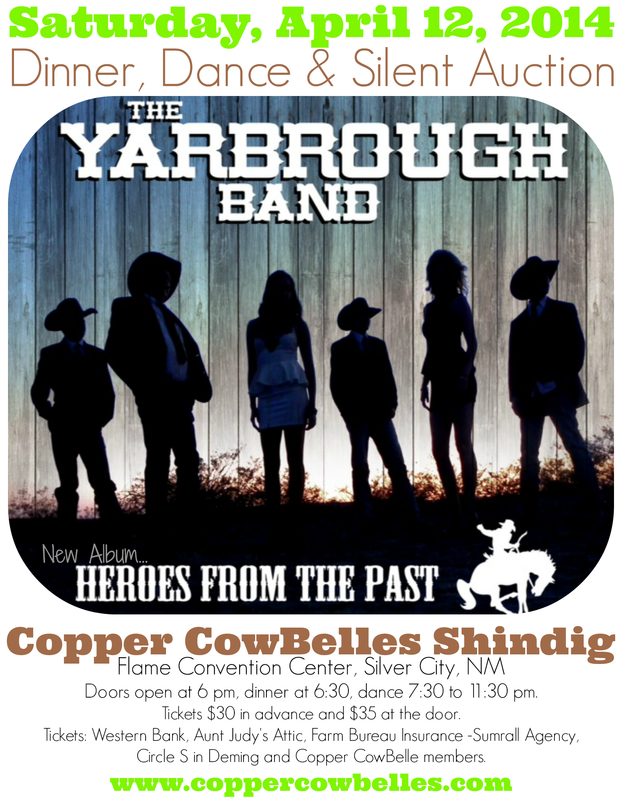 The date for the Copper CowBelles 2014 Shindig is Saturday-April 12th. We have reserved the Flame Convention Center and booked The Yarbrough Band. The CowBelles leadership have selected the theme “SPRING ROUND-UP” and are well on their way to planning the annual event. Make plans to join the CowBelles for an evening of dancing, making new friends and renewing old acquaintences. The event will be a dinner, dance and silent auction as it has been in the past. We are working on confirming our caterer, getting auction items, and printing tickets and posters. Hope you will make plans to join us on April 12th! Any questions, please contact Copper CowBelle Co-President Judy de Pedro at 575-535-2567.